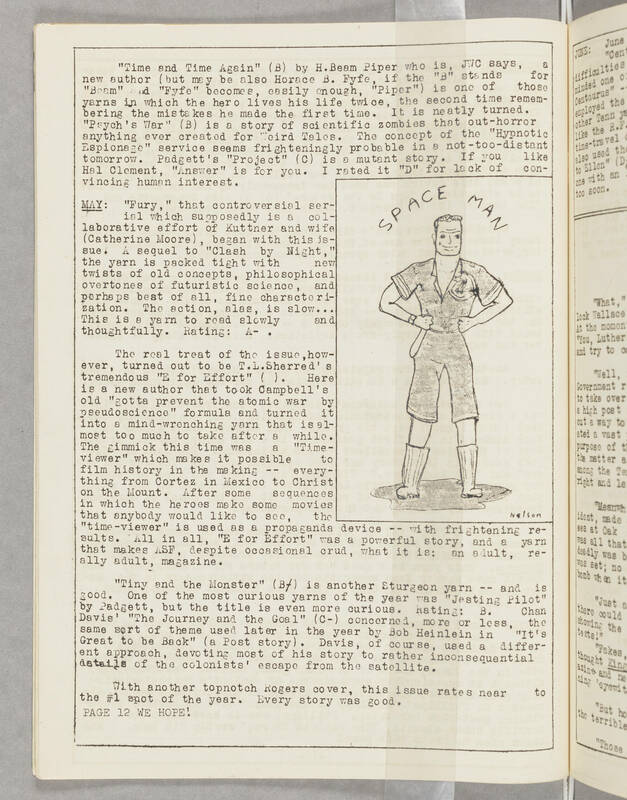 [[illustration text]] SPACE MAN Nelson [[end illustration text]] "Time and Time Again" (B) by H.Beam Piper who is, JWC says, a new author (but may be also Horace B. Fyfe, if the "B" stands for "Beam" and "Fyfe" becomes, easily enough, "Piper") is one of those yarns in which the hero lives his life twice, the second time remembering the mistakes he made the first time. It is neatly turned. "Psych's War" (B) is a story of scientific zombies that out-horror anything ever created for Weird Tales. The concept of the "Hypnotic Espionage" service seems frighteningly probable in a not-too-distant tomorrow. Padgett's "Project" (C) is a mutant story if you like Hal Clement, "Answer" is for you. I rated it "D" for lack of convincing human interest. MAY: "Fury," that controversial serial which supposedly is a collaborative effort of Kuttner and wife (Catherine Moore), began with this issue. A sequel to "Clash by Night," the yarn is packed tight with new twists of old concepts, philosophical overtones of futuristic science, and perhaps best of all, fine characterization. The action, alas, is slow... This is a yarn to read slowly and thoughtfully. Rating: A-. The real treat of the issue,however, turned out to be T.L.Sherred's tremendous "E for Effort" ( ). Here is a new author that took Campbell's old "gotta prevent the atomic war by pseudoscience" formula and turned it into a mind-wrenching yarn that is almost too much to take after a while. The gimmick this time was a "Timeviewere" which makes it possible to film history int he making -- everything from Cortez in Mexico to Christ on the Mount. After some sequences in which the heroes make some movies that anybody would like to see, the "time-viewer" is used as a propaganda device -- with frightening results. All in all, "E for Effort" was a powerful story, and a yarn that makes ASLF, despite occasional crud, what it is: an adult really adult, magazine. "Tiny and the Monster" (B-) is another Sturgeon yarn -- and is good. One of the most curious yarns of the year was "Jesting Pilot" by Padgett, but the title is even more curious. Rating: B. Chan Davis' "The Journey and the Goal" (C-) concerned, more or less, the same sort of theme used later in the year by Bob Heinlein in "It's Great to be Back" (a Post story). Davis, of course, used a different approach, devoting most of his story to rather inconsequential details of the colonists' escape from the satellite. With another topnotch Rogers cover, this issue rates near to the #1 spot of the year. Every story was good. PAGE 12 WE HOPE!